Many people would like to delete files by Shift+Delete. Me, too. But I know it's not a good way to use Windows or even Mac (Command+Delete). We put our files in a dangerous situation, without protection from improper operation. The files deleted by Shift+Delete will disappear from your system. You won't find it in the Recycle Bin or somewhere else, unless you have backup files. So is there a way to recover deleted files from desktop if you can't find them in the Recycle Bin? The answer is Yes. When you deleted files and emptied from the Recycle Bin, or deleted files by Shift+Delete, the files are only marked inaccessible but not erased. Only if you add new files to your computer, will your files be permanently erased by new files. Before that, you can use a file recovery software to save the files to a safe place. Here WS Data Recovery is recommended. 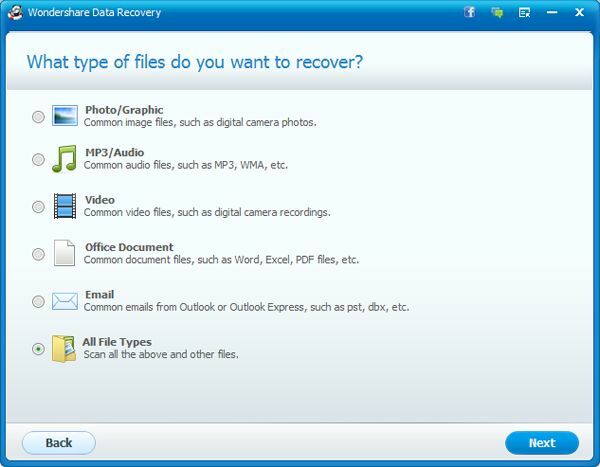 This desktop file recovery software can effectively recover deleted files from desktop and other frequently used folders like My Documents, My Pictures, Libraries, etc. Tips: To stop deleted desktop files from being overwritten, it's a good idea to install the software to an external hard drive or the partition other than the one your files reside. 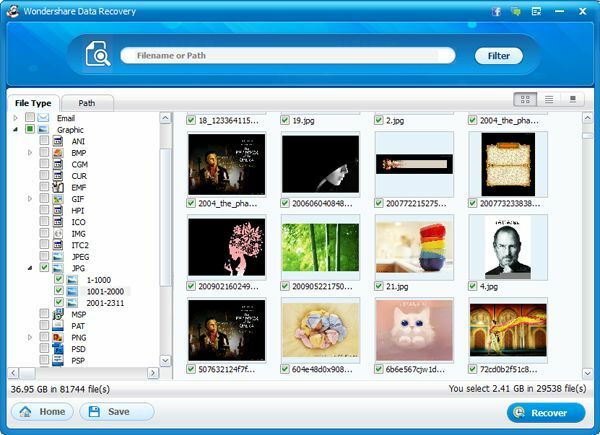 Now follow the easy steps to restore desktop files with the recommended desktop file recovery software. 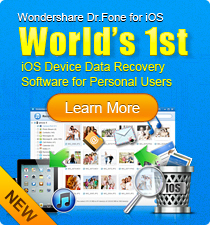 Run Wondershare Data Recovery after installation. You're able to recover data in Wizard mode or Standard mode. The former allows you to recover files by answering questions, while the latter provides you more options to recover files effectively. Here I'll show you how to recover deleted desktop files using the Wizard mode. First choose All File Types if you deleted files in multiple formats, or choose the specific file type, like Photos, Audio, Video, Document, and Email. 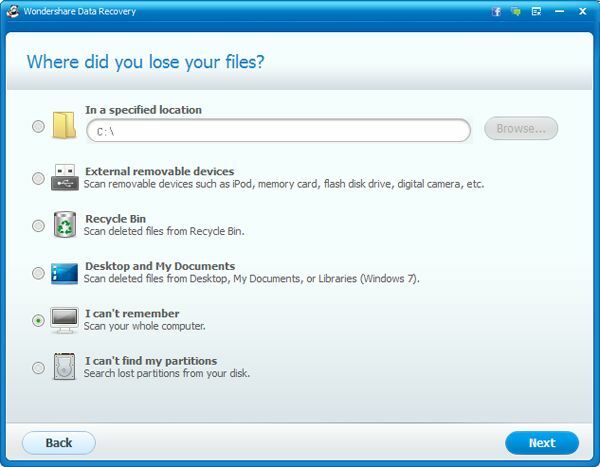 This desktop file recovery software can only search for the specified type of files deleted from desktop. Just choose Desktop and My Document in the "Where did you lose your files" window, and then click Next to start scanning deleted files. All files deleted from your desktop will be found and organized in a clear folder tree. Go to the specific file type category on the left to see whether your desired files are there. Or you can input a keyword to search for desired files directly. To recover a file, check the box and then click the Recover button. Q: My computer (running Windows 7) had some kind of virus on it. My antivirus software couldn't fix it so I did a system restore. Everything is returned to normal, but the problem is a lot of my files on Desktop have just disappeared. Can I recover them? A: Basically, a system restore will overwrite the current desktop files and replace with the desktop files that exists when you make a backup. It's difficult to recover all desktop files after a system restore. But you can try to recover as many desktop files as possible with the data recovery software introduced above. Download this desktop file recovery software now and follow the video tutorial below to retrieve deleted files from Windows Desktop. The Mac version is also available. Use it to restore desktop files on Mac.